Recently, four local, high-time twin pilots died in their aircraft and took nine others with them. They were more than potential customers to me, they were experienced, respected pilots who seemed to be doing everything right. Those pilots included two local aviation safety counselors and two high-time aircraft owners. These events led me to question what it takes to have a long, safe flying future. After informally surveying hundreds of pilots, I learned it comes down to making safe choices. When a pilot considers the aeronautical decision-making research on accidents, he quickly learns there isn't a single decision that leads to the scene of the accident. Actually, there is a chain of events that if interrupted by a single choice, the accident is prevented. The chain of decisions starts with a seemingly harmless poor decision but gets worse as the flight to the accident scene progresses. An aircraft has been said to be perfectly safe as long as a pilot decides not to fly it. The stats indicate that 85% of fatal aircraft accidents are due to poor choices made by the pilot. So we're left with 15% that we can't control: ATC operational events, equipment failure, etc. Clearly, aviation safety rests in our hands by the choices we make and how we manage the risks. Your success in this endeavor is measured by the accident that doesn't occur. As with all good things in aviation, there are far more questions than answers. Consider these ideas and how they could affect your aeronautical decisions. Let me know your thoughts and reactions. 1. Shortcuts are never good decisions. One of my instrument students taxied to the wrong end of the runway. When he finished the run-up, he realized that he needed to taxi to the other end because the wind had changed. When he got to the departure end, he attempted to enter the runway. When I stopped him, I queried him as to why he did not lean the mixture for taxi and whether another run-up was indicated. He thought it was not required and attempted to enter the runway environment again. I told him that it was an error that he did not lean the mixture for taxi and a run-up was required. He was not convinced, so I asked him to try it and see what happens. He was surprised to see the severe RPM drop during the mag check. After I explained how spark plugs can become fouled by not leaning the mixture, I told him that aviation is a series of choices. At that teachable moment, he (hopefully) learned that shortcuts are never good decisions. Compromising safety for the 'quick fix'/shortcut will eventually lead to disaster. The challenge with taking shortcuts is that sometimes they work. In your best moments, you realize what an efficient pilot you are and how doing that item on the checklist was a waste of time. The problem is that sometimes luck just plain runs out. When small careless mistakes add up, it will catch even the most experience pilot unprepared. On your worst day, it might be the last. 2. Follow the rules. The IFR system is a game of rules. When we step outside the rules, we really take our lives into our own hands. Such things as descent below the MDA without the runway environment in sight, improper fuel planning, poor situational awareness (where are you and what comes next), and incorrectly executing clearances are quick ways to end the game with a losing score. A recent accident in the Southwest Florida area underscores the importance of playing the game properly. A northern pilot starts on his cross country trip to Florida, bypassing hundreds of cheap fill-ups to land at his destination... the one without a landing fee. On his first missed approach he declares "fuel in the yellow" and fails to heed the controller's suggestion to go to the big airport (with a landing fee) but with lower minimums. On his second missed approach he loses an engine and declares an emergency. On his third approach he loses his remaining engine and becomes a twin glider. The resulting stall/spin accident cause in-flight separation of the propeller from the engine and it stabbed (straight down) a lazy boy recliner in a home below. All aboard were lost. The pilot's failure in proper fuel planning, choosing an alternate, and a desire to avoid a landing fee accelerated him to his fate that day. 3. Situational Awareness. Extensive thought should be given to your flight from take off to landing. (Read related article: Flight Profile Flying) A critical skill of a properly prepared pilot is the ability to ask AND answer, "Where are you and what comes next." Whether this relates to who you talk to and when, your progress enroute or on the approach, or the bigger picture of what's happening around you and why, your task is to think about the factors related to your flight and consider "what if". Two examples illustrate the need to ask "what if?" and "where am I what what comes next." Recently an instrument student practicing the Bravo Pattern under the hood was asked, "What would you do if you lost your engine right now?" Her answer was not the emergency procedures she should initiate but a dislike for the question asked. I explained that I was only considering the options as I was looking outside at the rough terrain. I told her I thought it would be a difficult engine out landing if we lost our engine. Sometimes aviation ain't pretty (Read related article: Anatomy of an Engine Failure). 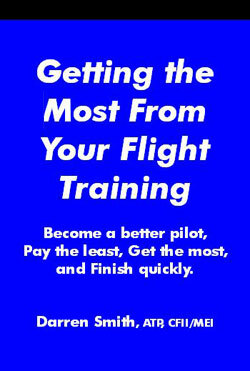 Another student was asked innocently enough, "Are you flying towards the inbound course?" His answer was, "I think so." My response was, "You flew through it about a minute ago." Do these scenarios happen just to student pilots or to all of us? If you answered "all of us" then you were correct but hopefully its rare. You have a choice whether you will challenge yourself with these two questions often during every flight: "Where am I and what comes next?" and "What if?" 5. Pilot Maturity. Making safe choices is related to the individual's maturity as a pilot. There is a world of difference between a pilot doing aerobatics 100 feet off the deck and low flight over open terrain. And then sometimes there isn't. It goes further than following the rules (Minimum Safe Altitude 91.119 in this example), its a sense of what makes a flight safe. Continuing VFR into IMC, conducting a flight without a preflight briefing, switching fuel tanks after run-up, take off on a high density altitude day with a full load, practicing maneuvers without clearing turns, flight at unsafe altitudes, and getting a fill-up without checking fuel quantity and quality are unsafe acts which should raise the hair on the back of your neck. What you don't know can hurt you. Read the accident reports at NTSB.gov if you don't believe me. Part of managing risk begins with recognizing risk then creating a readiness to respond to it. 6. Readiness mindset. Having an array of choices available when disaster hits is dependent upon your mindset. Are you always ready for trouble so you know how to manage it when the time comes? Your power to control risk and determine your fate should convince you that you have a number of things to consider. Are we always within gliding distance of a safe place to land? When you take off do you transition to a Vy climb to get a fast climb rate? If you are IFR in a single engine, do you check your route for high ceilings so that you would be able to break out at high enough altitude to react? Do you use all available navigational resources in the cockpit so that you always know where an airport is? Have you performed a very thorough preflight? Have you considered where you'll go if the engine quits on the departure leg? Have you even practiced a 180 degree turn back to the airport (at altitude)? Do you perform a takeoff briefing to review the options should the takeoff not go as planned? When you do an IFR approach briefing do you review the likely failures and your reaction to each? If you create a readiness mindset, you will be in a position to create the maximum amount of free time to think through an emergency and react appropriately. This eliminates mistakes and allows the pilot to process more variables and options. 7. Willingness to abort. The old adage "its easier to be on the ground wishing you were airborne than to be in the air wishing you were on the ground" is true today as it ever was. We often get caught up in the moment with get-there-itis or the 'lets get it done" mindsets. Stop and consider how willing and prepared you are to abort your next takeoff 2 knots short of rotation speed. Are you always prepared to return to your departure airport in case you find something you dont like? Do you have the approach plate ready and briefed? Encountering icing conditions on a departure, have you ever requested a climbing hold to see if conditions improve in the climb (remaining close to your departure airport with known weather)? Are you willing to make an enroute precautionary landing? Did you already listen to the ATIS when you got in range so you already know the weather and approach in use? Do you have the approach plate ready? What about your alternate approach plate? 8. Are you current and proficient? IFR skills: How does a 5000 hour pilot in a Piper Navajo stall spin into a house on a 1/3 mile short final for a runway? Was this pilot spring-loaded for a missed approach? The final report on the accident suggests he wasn't. Even a 5000 hour pilot should have the mindset: "I need to go practice more instrument approaches in different places" and should consider a refresher program such as the 3 day IFR Adventure. Aeronautical knowledge: How does a 3000 hour CFI and aviation safety counselor take a plane load of people down in icing conditions after passing a VFR airport 10 minutes back? Not only should we consider taking review and recurrency training, we should attend aviation safety meetings and expose ourselves to ideas from other pilots. Because you are reading this, I know you have made a good start. Start connecting with other people and sources of information on a regular basis. Night current: How does a private pilot flying his helicopter hit a well lit tower at night? If we don't keep our night skills current, we miss the subtle cues that night flying provides and what we can't see we can't avoid. What is your percentage of night VFR to day VFR? For the professional helicopter pilot, how much NOE and NVG time have you logged lately? Technology: With all the latest equipment installed in the newest aircraft, its easy to find equipment rich, skill deficient pilots at your local airport. We've all heard the phrase "more money than common sense" and it will be quickly applied to the pilot who had every tool to conduct a safe flight but still somehow failed. Do you know how to use all that stuff? Are you 'techno-current'?